Ambassador Christopher Sharrock took up his duties as Permanent Representative of the United Kingdom to the OECD in Paris on 11 January 2016. Mr. Sharrock was born in 1975 in Reading, UK. He holds a BA Hons in English Language and Literature from the University of Manchester, and an MSc in Economics from the University of London. Mr. Sharrock joined HM Treasury in 2003, where he has worked across a wide range of issues, including public spending, European Union and International policy, and in the Chancellor of the Exchequer’s private office. From 2012 to 2014 he held the post of Chief Economist at the UK’s Department of Culture, Media and Sport. Before joining HM Treasury, Mr Sharrock spent several years teaching. 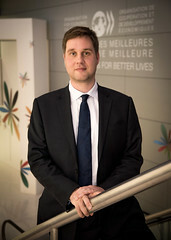 From 2014 until his appointment as Permanent Representative of the United Kingdom to the OECD, Mr. Sharrock was Deputy Director of the HM Treasury’s Debt and Reserves Management team, where he oversaw policy on the UK Government’s debt programme and foreign currency reserves, and was a member of the board of National Savings and Investments. Ambassador Christopher Sharrock is joined in Paris by his fiancée and has two children.